The perfect shade of coral/orange nail polish. – Rimmel Lasting Finish Pro in Orange Sunset. Surprisingly shiny. Cropped safari jacket Amazing Steal! Forever 21, $15. I get endless compliments on this jacket. It makes absolutely everything look “this season”. Next outfit… olive green mini dress with this jacket and black booties. White boyfriend blazer – Amazing Steal! Target (Merona) for only $29, complete with pinstripe lining for rolling up your sleeves. I have a very long torso and small bust, and I have endless trouble finding blazers. I’m getting this one taken in a teeny bit in the body, but I’m still blown away by the cut and the price. Striped tees, aviator shades, wrap hoodies, anything that I could wear on a yacht in a JCrew ad. 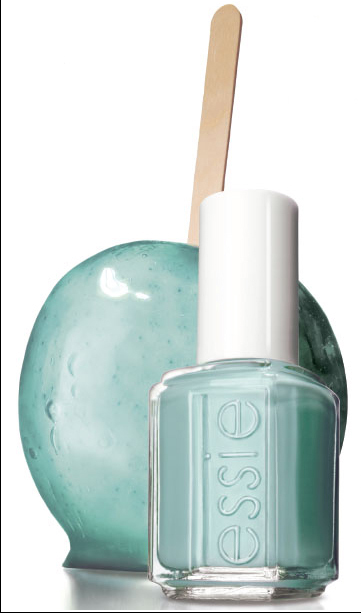 I’ve been trying to track down the new Mint Candy Apple nail polish from Essie’s Winter Collection for weeks now, but this little gem has been quite elusive. My mom called me from Bed Bath & Beyond to let me know they now stock Essie nail polish (as does Target), but no Mint Candy Apple. However, in my hunt I learned that Trade Secret will take 10% off the price of an item if you specifically ask for it and it is out of stock. So next time you’re searching for a special conditioner or round brush, be sure to ask about the 10% off if your product isn’t in stock. This shade is very refreshing to see in a winter collection; a frosty alternative to the plums, navies, and taupes that usually grace my fingertips. 12/12/2009 Update: I found it! Beauty Cosmopolitan had the entire winter collection in stock already! Mint Candy Apple was almost sold out already, so this is definitely going to be a hot color for winter!